via press release: NEW YORK, August 15, 2013 - Showtime Networks has joined forces with Smart TV leader LG Electronics to use LG's "LivePlus" technology to deliver the SHO Sync app on 2012 and 2013 Internet-connected TVs, giving viewers nationwide a new way to interact with their favorite SHOWTIME series, including the eighth and final season of DEXTER and the network's newest hit series, the critically-acclaimed RAY DONOVAN. 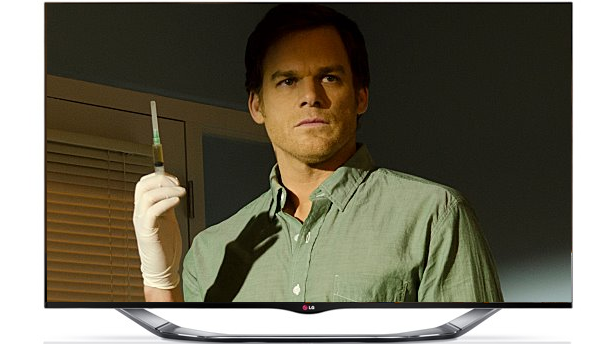 Showtime Networks and LG are the first to advance the capabilities of Smart TVs to provide viewers with a synchronized, interactive experience for television programming. The LivePlus synchronous content platform allows broadcasters, cable networks and other program providers to enhance viewers' TV experience by automatically delivering content to internet-connected Smart TVs without the need to install or download anything. Read the rest of the press release, after the jump. Designed to deepen the viewer's engagement with SHOWTIME series, SHO Sync presents special features, character backgrounds, trivia and polls at precise points in the program. Originally launched on the iPad as a two-screen companion app, SHO Sync for Smart TVs delivers the same crafted content to the big screen. When the LG LivePlus feature recognizes a SHOWTIME original series episode as SHO Sync-enabled, an invitation to play along will appear on screen, and the viewer can opt-in to the experience with a click of their LG TV remote. The LivePlus technology powers the sync experience regardless of whether the program is watched live, On Demand or from a DVR or DVD. "SHO Sync for Smart TVs is a breakthrough for the industry, offering a rich and interactive experience with a strong focus on content, where consumers can enjoy their favorite SHOWTIME series," said Donald Buckley, Executive Vice President, Program Marketing and Digital Services, Showtime Networks. "For the first time, viewers can click a single button, using their remotes and interact in a completely new way with our programming." "LG's LivePlus synchronous TV platform extends the capabilities of LG Smart TVs from delivering immersive content to enhance the TV viewing experience with compelling content authored by the programmers," said James Fishler, Senior Vice President of Marketing, LG Electronics USA. "While interactive TV has been previously done in many forms, this is the first time that standards such as HTLM5 have been used, enabling high-quality graphics using standard authoring tools. With SHO Sync, Showtime Networks has developed a sophisticated app that maximizes what is possible with high end, premium interactive experiences." SHO Sync's rich content significantly augments the TV viewing experience for fans of the network's award-winning and critically-acclaimed series. Fans can test their knowledge with trivia, earn points and badges, and compete against their friends and other fans. Viewers can also vote in live polls and instantly see real-time audience reactions. Written in each series' unique voice, the content is faithful to the tone of the programming, and its elegant execution ensures the experience is never disruptive. Using the TV's remote control, SHO Sync content can be easily shared to social platforms, including Twitter and Facebook. LG Electronics USA, Inc., based in Englewood Cliffs, N.J., is the North American subsidiary of LG Electronics, Inc., a $45 billion global force and technology leader in consumer electronics, home appliances and mobile communications. LG Electronics, a proud 2013 ENERGY STAR Partner of the Year, sells a range of stylish and innovative home entertainment products, mobile phones, home appliances, commercial displays, air conditioning systems and solar energy solutions in the United States, all under LG's "Life's Good" marketing theme. For more information about LG Electronics, please visit www.lg.com.